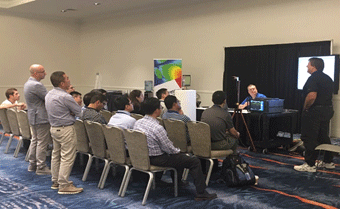 Last year, at the 2017 IEEE AP-S Symposium on Antennas and Propagation and USNC-URSI Radio Science Meeting in San Diego, California, we launched a new demonstrations program in the exhibit hall. This activity was initiated by the IIC - Industrial Initiative Committee of the IEEE-APS. The goal was to provide hands-on education in an interactive format on antenna propagation and measurement related principals. The program featured both hardware and software demonstrations. 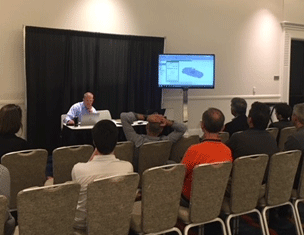 Since the demonstrations were well received, we are pleased to offer them once again during the 2018 IEEE AP-S Symposium on Antennas and Propagation and USNC-URSI Radio Science Meeting in Boston, Massachusetts. The purpose of this unique program is to demonstrate important antenna concepts with a focus on innovative ideas and methods that are of interest to practicing antenna engineers. Topics addressed may include Antenna theory, design, and measurements; Microstrip antennas and printed devices; Millimeter wave and Terahertz antennas; MIMO antennas and systems; Nanoscale electromagnetics; Radio communication systems, etc. In short, any of the technical topics shown on the 2018 IEEE AP-S Symposium on Antennas and Propagation and USNC-URSI Radio Science Meeting Call for Papers may be addressed in the demonstration program. To participate in the demonstrations program at the 2018 IEEE AP-S Symposium on Antennas and Propagation and USNC-URSI Radio Science Meeting in Boston, Massachusetts, please submit a proposal for your demonstration using the following guidelines. Abstract of demonstration (including what will be shown and what people will learn) – no more than 200 words. Educational content rather than a “sales pitch” is preferred. Summary of support equipment needed for your demonstration (i.e. instrumentation, etc.). NOTE: The Symposium Committee will provide a demonstration “station” which includes one table, chairs, power, microphone for speaker, and video display monitor for presenter’s laptop computer. If you require additional support equipment, please so advise in your proposal. Schedule preference – advise date, as well as morning or afternoon time slot, during the open hours of the symposium exhibit hall, i.e. 9am-4pm Tuesday-Thursday, July 10-12, 2018. All presenters are required to have a full symposium registration fee paid in advance in order to participate in the demonstrations program – NO EXCEPTIONS! Presenters in the demonstrations program may be from industry, academia, and/or government. Presenters are responsible for ensuring their content may be shared with the public. Proposals are due on April 20, 2018. The technical program committee will review all proposals. A balance between hardware and software proposals is desired. Accepted proposals will be announced on May 8, 2018. Accepted proposals will be promoted on the symposium website, the symposium mobile app, via social media and via signage on site during the symposium.